This 1,000 sqft home in Studio City was completely transformed inside and out into a bright, modern and comfortable space. The full transformation started with new floor plans opening the kitchen, dining room and living room to create the illusion of more room and light. New roof, windows, doors and AC system were added, and an entire wall was removed giving place to this beautiful open kitchen and dining area. A new concrete finish Venetian plaster wall was created for the brand new fireplace, and it also includes a wall mount TV and speakers. 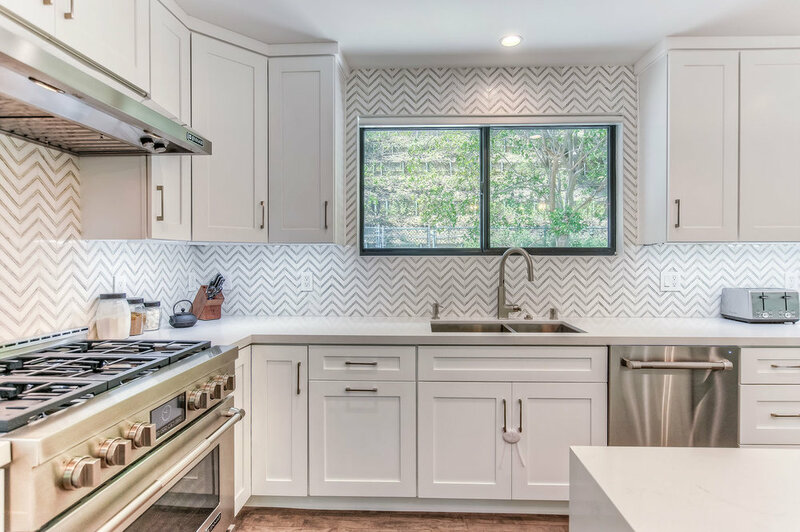 The new open kitchen features new white shaker cabinets, Caesarstone countertops, marble chevron tiles from Spazio LA Tile Gallery and all stainless steel Jenn-air appliances. Both the master bedroom and nursery feature new custom closets, and the bathroom was completely renovated to include a custom flat panel vanity with engineered quartz countertops and beautiful patterned porcelain tiles on the floor and walls. Click below to check out the full project and before & after. The dining room and kitchen area were completely transformed with a new open floor plan for a spacious and bright look. The space features all new black aluminum windows and french doors, original floors restained with a light grey color and all new recessed lights. The floor plan also opens up to the living room, featuring a new electric fireplace with concrete looking Venetian plaster on the wall with recessed TV and in wall speakers. The new open kitchen features white shaker cabinets with Caesarstone Frosty Carrina countertops with waterfalls on both sides of island and sink; marble chevron tiles backsplash from Spazio LA Tile Gallery; all stainless steel Jenn-Air appliances and faucets from California Faucets. The new open floor plan open up to the living room, featuring a new electric fireplace with concrete looking Venetian plaster on the wall with recessed TV and in wall speakers. The exterior features all new roof, smooth white stucco walls, black aluminum windows, black stained mahogany door with glass and french doors with black aluminum and glass facing the backyard. The house also features a brand new central AC system. The bathroom was completely transformed and features custom flat panel glossy finish vanity; Caesarstone pure white countertop with waterfall; drop-in tub with matching Caesarstone surface; custom frameless glass shower door; wall mount toiled; porcelain calacatta walls and Spanish porcelain floors with antique design pattern on floors, both from Spazio LA Tile Gallery. 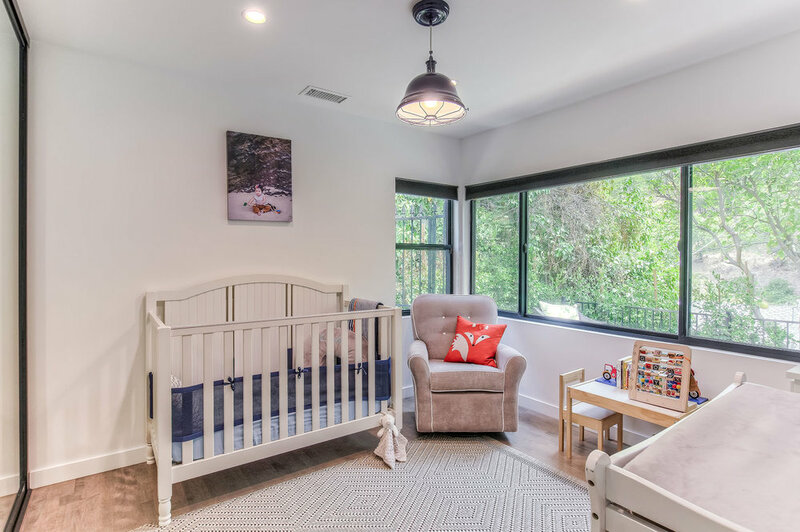 The nursery features all new black aluminum wall to wall windows, custom KNR floor to ceiling black aluminum closed with sliding doors and restained original harwood floors. The master bedroom all new black aluminum wall to wall windows, custom KNR floor to ceiling black aluminum closed with sliding doors and restained original harwood floors. At SPAZIO LA, we strive to create unique and innovative spaces that reflect beauty and functionality ALWAYS with our clients in mind. We would love to design and build or remodel your dream home! Contact us today for a complimentary in-house design estimate.